Just like last year, the Reading Phillies are offering their Kids Club program for kids 12 and under, and amazingly, there is no charge to join. One of the perks of membership is a free ticket for kids to each of seven designated games during the season. How could we refuse such an offer? This past Sunday was the first Kids Club game of the year. In addition to the free ticket, members of the Kids Club get to take part in a special pre-game activity for club members only. This game’s activity was an on-field photo session with almost all the R-Phils players, with the exception of that day’s starting pitcher and catcher. Of course, the big draws, top prospect Domonic Brown and newest propects Phillippe Aumont and Tyson Gillies, were at opposite ends of the warning track, with everyone else arranged alphabetically in between. So we needed to make a choice – go to Brown first, or Gillies and Aumont? 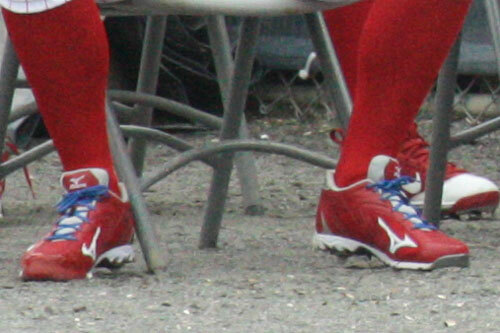 Domonic generates a lot of speed with those incredibly skinny calves! In the bottom of the first, he walked the speedy Brown, and then hit Tagg Bozied with a pitch, but managed to escape unscathed. Bozied apparently shook off being hit on the hand/wrist (I couldn’t really tell exactly where – Bozied bats right-handed, so his back was to us, as we were seated on the third-base side) as he ripped a two-run double in the third to put Reading on the board. After six innings, Reading was up 2-0 in this quick moving pitching duel. Then, the relievers came in. B.J. Rosenberg gave up four runs in the top of the seventh, on a solo home run by Lars Anderson, and a three-run homer by Jason Place. The Sea Dogs now led 4-2. Rosenberg was later placed on the DL with a strained muscle, so maybe that explains the rough outing. In the minors, the manager often doubles as the third base coach. Reading tacked on another run in the eighth, and held on to win 6-4. A great day at the ballpark, with the temperature comfortably in the low 70’s, and an R-Phils victory! Now we have to wait until May for the next Kids Club game. So I’m a little slow in getting around to writing this entry. The final Reading Phillies Kids Club game of the season was on August 30, and now it’s September 9. Better late than never! The pre-game Kids Club activity for this evening was an on-field photo session with various R-Phils players. For some undetermined reason, neither of my kids felt like doing it. Hmm. As one might expect, top prospect Domonic Brown had the longest line of fans waiting for their photo op with him. The entire photo session ended up lasting all of 20 minutes, so in a way it was just as well that the kids decided not to get in line, as we may have ended up not getting our chance anyway. In the meantime, my husband ran into the husband of one of my good friends, who was there with his kids. As they were loitering in front of the customer service booth, the woman behind the counter asked them if they wanted to participate in one of the on-field contests between innings, which required two adults and two children. My friend’s husband said “Yes!”, and my husband (who doesn’t like to be a public spectacle) said “My wife will do it.” Photographic proof is further down this post. Due to rainouts on the previous two nights, a double-header was scheduled, with the first game actually resuming in the bottom of the second inning, the point at which it had been suspended the previous night. 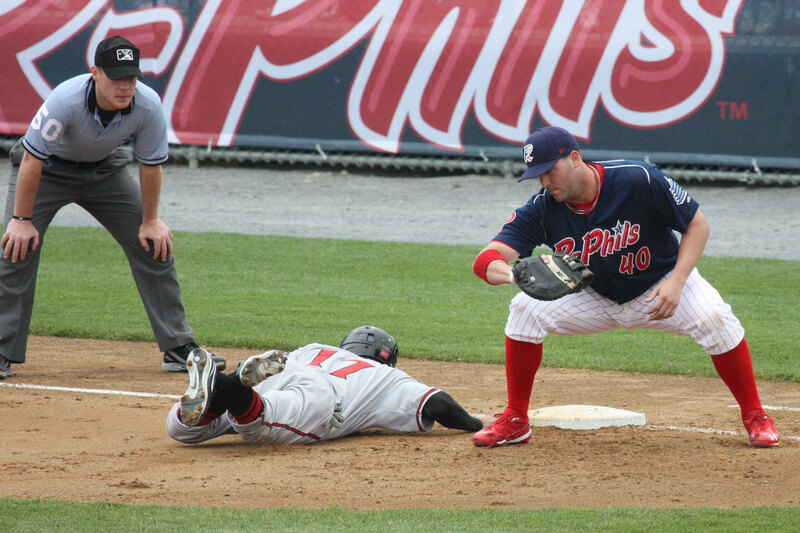 So as the game began, the R-Phils were already on the losing end, 1-0. My friend’s husband is on the left, I’m on the right, and my son is the one in black. My friend’s son is obscured behind me. Neither we nor the other group got any balls through the target, though some came close. It’s a lot harder than it looks – the soft stuffed balls tend not to fly straight. I’ve never seen any go through at games I’ve been to, though occasionally someone does make it. Better stick to your normal hairstyle! By the third inning, my son kept complaining that his stomach hurt. Could it be because he’d eaten (in this order) a helmet of Dippin’ Dots, two hot dogs, a Sprite, and a massive order of french fries? Let’s just say things were a bit unsettled, and we ended up leaving early. Shortly after we left, the R-Phils pitching imploded, so I guess it wasn’t a tragedy that we left when we did. That’s Domonic Brown in front, and a (thankfully) unidentified R-Phils player in the back. Give me your most creative captions, and I’ll be sure to “pick” a winner! Cripes, just when I think I’m getting back into a regular blogging roll, my train of thought gets all derailed. When I posted last Thursday, I was getting ready to go to my first-ever professional football game, a preseason matchup between the Eagles and the Patriots. I never knew parking was so much more expensive for football games than for baseball games! Thank goodness we’d gotten the tickets themselves for free. The weather cleared up nicely, and we had a pleasant evening. The Patriots were looking pretty good, but the Eagles unfortunately were not. On Sunday, we made our way to Reading for Kids Club Game #4 at the Reading Phillies. Upon entering the stadium the kids received the special giveaway that day, the Crazy Hot Dog Vendor laundry hamper. The special activity for Kids Club members was a pregame question-and-answer session with several of the R-Phils players. 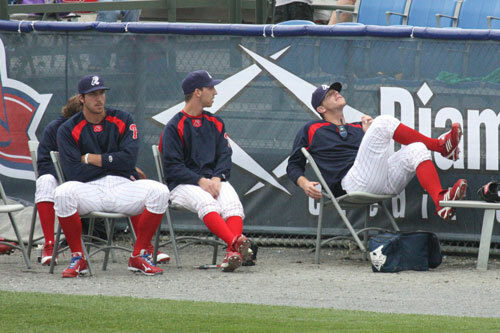 From left to right are catcher Kevin Nelson, pitchers Chance Chapman and Scott Mathieson, and outfielder Kevin Mahar. Instead of typical baseball-related questions you’d expect from adults, kids are apparently interested in all kinds of other information. Questions ranged from “What’s your favorite football/basketball/hockey team?” to “How much money do you make?” (answer: “Not enough!”) to “Where do you live during the off-season?” (Chapman sheepishly revealed he still lives with his parents). So what burning questions did my offspring have? From my 11-year-old son came “What’s your favorite video game?” (NHL ’09 for Mahar, Rock Band for Chapman, and Mario Kart for Nelson. Mathieson didn’t seem to have a favorite.) and “What’s your favorite TV show?” (Mathieson: “The Office”; Chapman: “Lost”). Nelson and Mahar had to leave for batting practice about halfway through. My 8-year-old daughter needed to know “Do you have any pets?” (a cat and dog for Chapman, and a dog for Mathieson) and “Are you married?” (a resounding “No!” from Chapman, yes for Mathieson). After the Q and A session, we had time to mosey around until the game started. Several R-Phils players stopped on their way between the field and the clubhouse to sign autographs, including top pitching prospect Kyle Drabek. As Reading’s stadium has been around since 1951, it’s not the most modern. The players have to cross the public concourse to get between the field and the clubhouses. and Eric Niesen took to the hill for the visiting Binghamton Mets. Both starters pitched well, and the teams traded zeroes on the scoreboard throughout the afternoon. 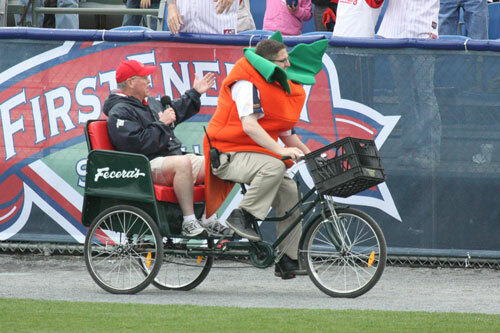 Yes, they are racing vegetables. In addition to the broccoli and cauliflower represented here, there were also lettuce and bagged veggies participating. My daughter was rooting for the broccoli, since it is the only vegetable she will actually eat, and indeed the broccoli emerged victorious. The sundae (who was running barefoot) was the clear winner over the pizza slice and the popcorn. led off the inning. 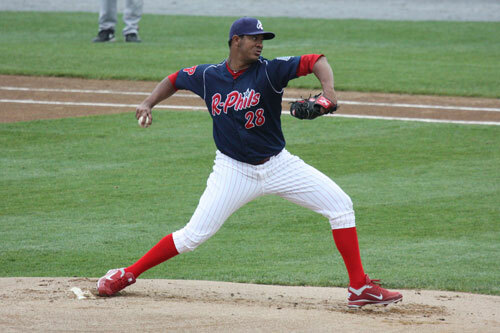 With only the fourth hit of the game for the R-Phils, Brown got things started when he smoked a double to left-center. The next batter, who shall remain nameless after striking out in his first three at-bats, attempted a sacrifice bunt but popped out to the pitcher, forcing Brown to hold at second. The next batter was intentionally walked, bringing up Kevin Mahar, from our pregame Q and A. Mahar hit a hard grounder to the second baseman, who made a diving stop but then launched it over the head of the first baseman, allowing Brown to easily score the winning run. R-Phils win, 1-0! The kids are now eagerly looking forward to the final Kids Club game of the season, on August 30, which will feature a pregame photo session with the players, and postgame fireworks. In Part 2 of What I’ve Been Up To, hopefully forthcoming sooner rather than later, I’ll cover my day this past Wednesday at the Phillies Baseball 101 for Women event, featuring a photo op with the World Series trophy, on-field sessions with the Phillies coaches, Q and A sessions with J.A. Happ, Charlie Manuel, umpire Laz Diaz, and radio personalities Scott Franzke and Larry Andersen, and of course a ticket to that night’s game against the Arizona Diamondbacks.